Starry night is perfect for loved ones who miss the stars and/or want to lighten up their dinner table. This centerpiece has its star right in the center with the lantern that comes with working tiwnkling lights with two settings. One of the settings can make it seem like there’s fireflys inside! 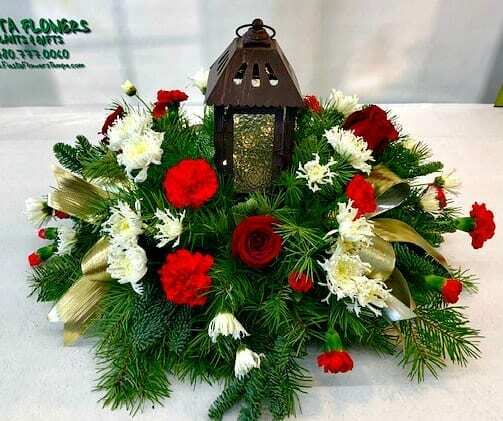 Surrounding the reusable lantern are vibrant red Carnations, deep red Roses, and creamy white Mums. It’s overflowing with various Christmas greens and fun bows!